TEN peach recipes are in Elizabeth Ellicott Lea’s Domestic Cookery (Baltimore, 1846) including Spiced Peaches and To Pickle Peaches. The Spiced Peaches are delightful, but they cook down, so do halves or quarters (photo below). On August 24, 1814, food was prepared for a 3:00 dinner for forty. There were cut glass decanters of ale, cider and wine placed in coolers, plate warmers by the fire and a variety of meats on the spits. The British troops sat down to a fine repast... then immediately set fire to the President's House. A nice thank you for the meal. Salt was important to preserve meat (like salt pork) in order to feed the soldiers. 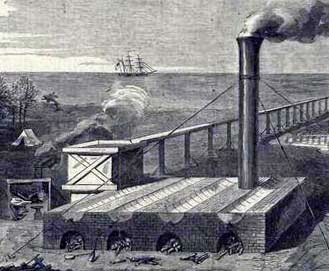 Thus, the Union navy conducted raids on Confederate salt-works, as illustrated and described in Harper's Weekly, Nov. 15, 1862.